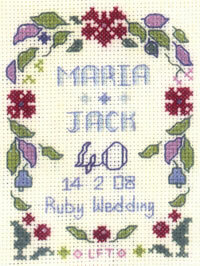 in delicious gemstone colours of ruby and amethyst with a leafy border. in delicious gemstone colours of ruby and amethyst with a delicate leafy border. 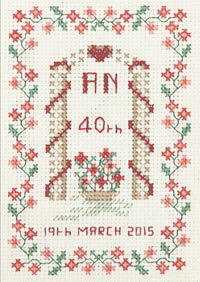 A mini Ruby Anniversary sampler cross stitch kit for a 40th Wedding Anniversary. so 14 count is recommended for beginners. A full alphabet is provided for you to add names and date for the couple.